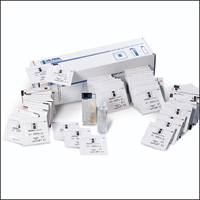 Hanna Instruments test kit HI3874 for nitrate nitrogen NO3-N. Nitrate is an important parameter to test for environmental management. Nitrate easily leaches into groundwater or runs off into surface waters. Levels over approx 1 mg/L indicates possible contamination. The kit tests in the range 0-50 mg/L in steps of 10 mg/L. The kit contains 100 tests.